CruCon® Cruise Outlet - Every Cruise On Sale Every Day! Cruise Outlet is a full service North American cruise travel agency working with guests from all over the world! From our headquarters in the Lakes Region of New Hampshire, we send over 90,000 people on cruises every year. CruCon Cruise Outlet has been in business for nearly 20 years and is a fully staffed cruise agency with certified cruise specialists who are all under one roof. We deeply believe in teamwork and that is why you will find that we do not have any home-based agents or outsourced employees. 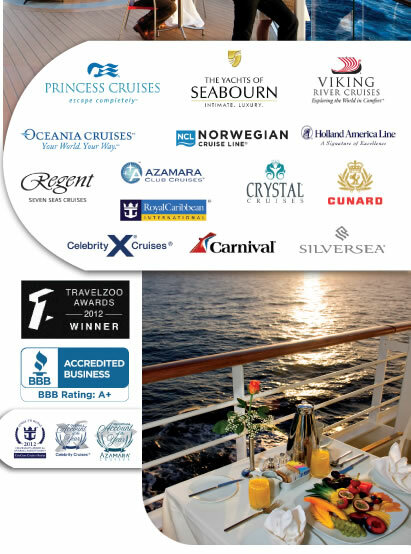 We work with all major cruise lines (luxury, premium and budget) and have won such awards as Vacation.com's Chairman's Award, Royal Caribbean Cruises Chairman's Award, Celebrity Cruise's President's Award and Norwegian Cruise Line President's Club Elite Agency of the Year. CruCon Cruise Outlet has also been voted "Best" for 5 years by Travelzoo. CruCon holds memberships with credible agencies such as the National Association Cruise Oriented Agencies, Cruise Lines International Association and American Society of Travel Agents. CruCon also proudly maintains an A+ rating with the Better Business Bureau. Click here to see what our satisfied customers have to say! If there is a cruise in your future, you owe it to yourself to book with us. We offer our lowest price guarantee so you can count on the best value for your vacation dollars. Click Here for more details. We will get you everywhere you want to go. All of your favorite cruise lines to all your favorite destinations. At CruCon, we provide you with the lowest price guaranteed, so that your vacation dollars can go farther. 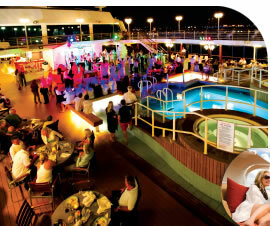 Check out our cruise ideas for Work or Play. Military Discounts: Thank you for your service. Be sure to let us know of your military service so we can honor you with special discounts and/or perks on select cruise lines. Honeymoon Registry Program: This program makes it easy for people to give the gift you really want…an incredible honeymoon cruise. Meetings at Sea: Let our experts plan your corporate meetings – from intimate board meetings to formal events that seat over 1200. Let us show you how. We organize, coordinate and guide you and your group for a unique (and productive) corporate cruise. Corporate Sales Incentives: Give an incentive that will push your sales goals over the top. With our help, you can provide your staff with a reward that they will cherish for a lifetime, and there is absolutely no charge for our service to you. 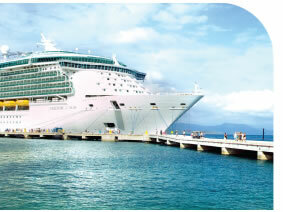 Employee Benefits: Your company can offer your employees a way to save on their vacation cruise. Ask for details. Ready to get started? Click here and pick the cruise destination you are interested in. Submit your information or call us directly at 800-493-6609 and our travel experts will research the very best cruise package and price and call you back to review and help you with your customized cruise package. There are so many details involved with booking a cruise, why not let us help you with all the details and decisions and save you money at the same time.